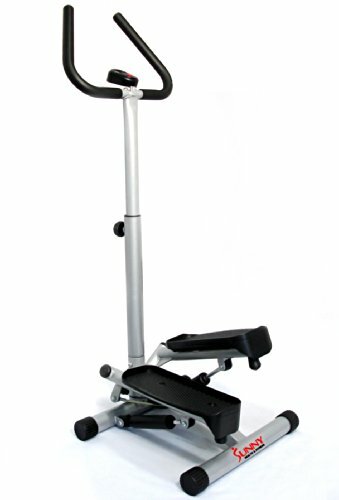 Stepper with twisting action to work buttocks and thighs without stressing bones and joints Adjustable stepping height Handle bar helps you keep your balance; non-slip foot plates provide safe, secure stepping Computer with LCD screen to display count, total count, calories, scan, and time Heavy-duty steel construction for stability and durability Manufacturer’s warranty included – see Product Guarantee area for complete details About Sunny Health & Fitness Sunny Health & Fitness has been importing and distributing high-quality health and fitness products for over ten years. From their headquarters in Los Angeles, California, they import equipment from direct sources in Taiwan and China to provide more competitive pricing than the average health and fitness equipment distributor. Because they are committed to excellence and stand behind the quality of every one of their products, Sunny Health & Fitness has become one of the fastest-growing companies in the market. Dimensions: 19L x 17W x 48H inches. Works deep muscles without stressing bones or joints. Twist action to tone buttocks and thighs. Heavy-duty steel construction. Handle bar for balance; non-slip foot plates. Manufacturer’s warranty included (see product guarantee).